In 1940, inspired by a tragic accident, a New York pathologist came up with the scenario for a perfect murder. His idea was based on the deaths of five longshoremen, their bodies found in the cargo hold of a steamer docked on the East River. The boat had been carrying cherries from Michigan. The men had been bunking in the room where the fruit was stored and to the shock of their co-workers, as work started to unload the cherries, all five were found lifeless in their beds. When investigators from the New York City medical examiner’s office arrived, they discovered that the fruit had been chilled by placing large containers of “dry ice” in the storage area. Dry ice was, of course, not ice at all but carbon dioxide (CO2) in its solid form, resembling breathtakingly cold chunks of frosted glass. At standard atmospheric pressure, water (H2O) ice freezes as temperatures slip just below 32°F. Carbon dioxide solidifies (a process called deposition) at −109.3 °F. As it warms – say, as it sits in a fruit storage area – it begins returning to its gaseous state, a transition known as a phase change. The solid chunks shrink without the seeping wet of melting water ice, hence the name dry ice (patented in 1924 by the DryIce Corporation of America). Instead there is a steady seep of gas in the surrounding air. Mostly this is nothing to worry about - unlike its chemical cousin, carbon monoxide (CO), carbon dioxide is not acutely poisonous – and, in fact, the chilly vapors lifting off dry ice have been used to create a fog effects in places ranging from theatres to Halloween parties. But there is a risk. Carbon dioxide is denser than oxygen-rich air and can, notably in confined spaces, essentially displace the breathable atmosphere, settling into its surroundings like an invisible but suffocating blanket. And this is what the city’s medical examiners realized had happened to their dead longshoremen. The men’s blood was “saturated with carbon dioxide and the men had obviously died from asphyxia,” explained assistant medical examiner Edward Martens in his 1940 book, The Doctor Looks at Death. Still, Marten considered that a better tip for fiction writers than real-life killers. The purchase of dry ice was easy to track, the material so cold as to bring on frostbite if handled improperly, and an ideally airtight room almost impossible to find. And someone, after all, might wonder about that peculiarly placed empty pail. Nevertheless, I’d like to take this moment to pay tribute to carbon dioxide, as one of the most important – and dangerous- gases on the planet. We tend to discount its lethal potential by contrast with its toxic chemical cousin, carbon monoxide (CO). Thanks to its ability to block oxygen circulation in the blood stream, carbon monoxide drifting from faulty heaters, generators, cars accidentally left running, furnaces and other fuel-burning machinery is estimated to kill some 500 people in the United States every year and send thousands of others to doctors and hospitals. Left ro right: Carbon dioxide, Carbon monoxide, and Carbonic acid. And we tend to discount carbon dioxide as an actual poison because we’re focused instead on all the other ways it can – and does - cause trouble. These days, it’s best known its best known as a “greenhouse gas”, for its ability to trap heat in the atmosphere. Numerous studies have found that levels of CO2 have risen steadily due to human activities – ranging from industrial burning of carbon-rich fuels to deforestation to agricultural practices. The U.S. Environmental Protection Agency estimates , for instance, that in 2005, “global atmospheric concentrations of CO2 were 35 percent higher than they were before the Industrial Revolution.” Although other gases are also linked to the current scenario of human-induced climate change, carbon dioxide is considered by many to be the most important factor. Of course, even that doesn’t really give full credit to the ways that carbon dioxide can alter the environment. For instance, scientists calculate that our oceans absorb a good proportion of the gas generated by human activities. 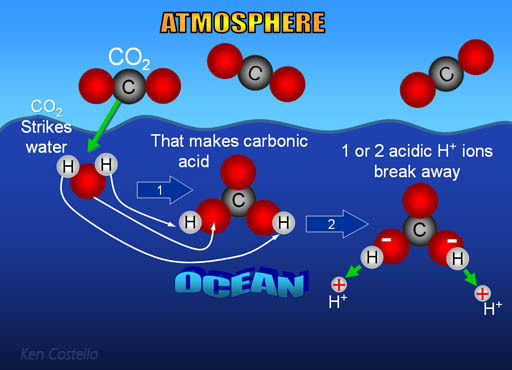 Unfortunately, when you dissolve CO2 into H2O you rather logically end up with the compound H2CO3, better known as carbonic acid. If you don’t recognize it, it’s the rather weak acid found in carbonated soft drinks (although not so weak that countless middle school students haven’t studied its corrosive effect on everything from teeth to lug nuts). It’s not surprising, then, that marine biologists have expressed alarm about the increasing acidification of the oceans. One recent report I found evaluated predicted increases in carbonic acid levels on California mussels, finding a notable thinning of their shells and a decrease in their overall size. A study conducted by Norwegian scientists also found that overall that mussel larvae decreased in size, but suggested, hopefully, that the effects might be mitigated if, as seemed probable, only the larger larvae would survive. Of course, mussels aren’t far from the only species at risk, as a National Science Foundation report concluded recently, listing everything from coral to marine algae. Which is just another way of saying that we’re deep into a global chemistry experiment with one of nature’s most important – troublesome and occasionally lethal – chemical compounds. There are many reasons, in fact, why we should regard carbon dioxide with respect, if not wariness. And, certainly, one finds that kind of response at a subconscious level. A rather fascinating experiment a couple of years ago found that just inhaling a small amount carbon dioxide triggered a fear response in mice. And there’s an equally fascinating wealth of research about the relationship between human panic disorders and CO2 inhalation. Far beyond my New York murder scenario, there’s rather horrifying evidence that occasionally this can be a panic-worthy gas. The best example of that comes from a real life event, a catastrophic natural release of carbon dioxide in Lake Nyos in Cameroon during the summer of 1986. Beneath that beautiful lake, geothermal seeps release CO2 into the deep lake waters, normally trapped near the bottom by pressure and cold. But in this case, apparently, the lake became oversaturated with the gas and on August 21, 1986, the lake waters effectively turned over, carbon dioxide fizzing explosively upward, the waters of Lake Nyos turning a startling red as iron deposits were stirred about. The rapidly released gas settled in a suffocating layer into the valleys around the lake. So many people died – an estimated total of 1,746 – that eventually the website Snopes.com felt compelled to investigate. Snopes reported that the event was real and, in fact, not the only case of suffocation deaths due to carbon dioxide seeps at lakes in Cameroon. Since that time, in fact, measures have been taken to maneuver the gas out of the lakes. And this, of course, brings me back to plotting a CO2 murder. I discovered Martens’ theory and his long out-of-print book while researching early 20th century forensic toxicology a few years ago. At first, I just liked the improbability, a medical examiner cooking up a supposedly unsolvable murder. But what’s stayed with me is the implicit message –that we’re talking about a dangerous compound. It’s a message to remember as we move deeper into our global experiment in greatly increasing the amount of carbon dioxide in our environment. For those who haven’t taken the experiment seriously – in my opinion, still far too many – it’s a reminder that they should start doing so now. And for those who need no reminder of the bigger carbon dioxide picture, I think I can still pass along at least one useful tip - in case of strangers bearing buckets of dry ice, sleep with your windows open. * In case the title sounded familiar but you could not exactly put a finger on it, see. About the Author: Deborah Blum is a Pulitzer-Prize winning science writer and the best-selling author of The Poisoner's Handbook: Murder and the Birth of Forensic Medicine in Jazz Age New York. A professor of science journalism at the University of Wisconsin, she blogs about chemistry culture at Speakeasy Science.